Arturo Chiriboga, a native of Ecuador, creates this twist on Bavarian blue at Kaserei Obere Mühle in the foothills of the Bavarian Alps. Drawing on his love for Roquefort and the region’s traditional Bavarian Blue, Arturo makes this cheese four times per week, using milk from local, grass fed dairies who belong to the Obere Mühle cooperative. 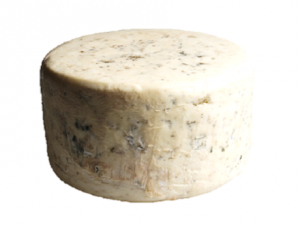 Ready for market at barely a month old, Chiriboga Blue is rindless, with a thick paste, creamy mouth feel and bright, tangy flavors. Its light veining adds a bit of tangy punch to the flavor, but overwhelming flavors of cream and butter linger on the palate. Kaserei Obere Mühle is located in Bad Oberdorf, a picturesque mountain town at the foothills of the Bavarian Alps. Arturo Chiriboga, the master cheesemaker at Obere Mühle, was born and raised in Equador and went to Europe as a young adult to learn the art of making cheese. In Europe he met and fell in love with a Bavarian girl, who he followed home to the Alps to begin his career in cheesemaking. Obere Mühle dairy uses only organic milk of the highest quality, from five local farmers who belong to the Obere Mühle Cooperative. The milk is used to make 14 varieties of cheese, from traditional Alpine style cheeses, to Chiriboga Blue. PROFILE Thick, creamy mouthfeel with bright, tangy flavors.